Bowflex TreadClimbers are the perfect machines for those who want to walk their way to fitness. Their unique design allows you to burn more calories than on traditional treadmills, without the impact on your knees and joints. The Bowflex brand is owned by Nautilus, Inc., a world leader in health and fitness. They also own Scwhinn, Universal and Octane Fitness. In 1986 Nautilus, Inc. was known as Bowflex 2000. A few years later they changed it to Bowflex, Inc. and updated it once more to Nautilus, Inc. when they bought Nautilus, Schwinn and Stairmaster Fitness. Bowflex is a name with a strong reputation in the fitness industry. They are renowned for the home gym equipment they design and sell, but also for the ellipticals, TreadClimbers, Max Trainers, treadmills and gym accessories. BowFlex TreadClimbers are mainly designed for calorie burning/weight loss workouts. They essentially combine three cardio machines in one: a treadmill, a stepper and an elliptical, giving you the benefits that each one provides. Currently there are only two TreadClimber models being sold: the all new TC100 and the up-level TC200, both huge improvements over previous versions. The base TC100 features a fully backlit LCD display, up to 4 mph speed, heart rate grips, USB charger and a 2 year warranty. It has a compact, space friendly design and transport wheels with a 300 lb. max weight capacity. The TC200 is a more advanced model, and costs around $1000 more than the TC100. It adds 5 built in workout programs, longer treadles than the TC100, up to 4.5 mph speed, Bluetooth workout tracking, wireless heart rate monitoring and a 3 year warranty, in addition to all of the features and capabilities of the base model. Both machines can purportedly burn 2.5x as many calories per minute as you can at the same speed on a treadmill, which makes sense as there is an incline element to it. That’s why the TreadClimbers are so popular with walkers. The TC100 and TC200 have interactive displays, water bottle holders, tablet holders and USB chargers. Why Should You Buy a BowFlex TreadClimber? Despite their hefty price tag, Bowflex TreadClimbers have remained enormously popular, and along with the Max Trainers are some of the best selling cardio machines of all time. What’s the allure? When you read consumer reviews what comes up most is the fact that you can burn a lot of calories without having to jog or run. Users really appreciate the fact that they can walk and still lose weight and get a good cardio workout in. Increased calorie burn in a short amount of time is a big selling point of most of the Bowflex machines, the main reason why they have become so popular, especially the TreadClimbers and the Max Trainers. 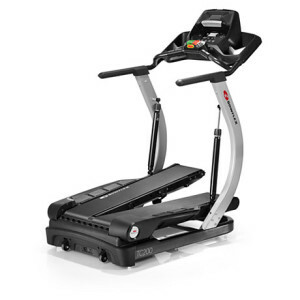 Users also appreciate its compact design…at only 55″ long, it’s at least 20″ shorter than a traditional treadmill, so it’s much easier to fit into smaller spaces. So you get three machines in one, with low impact and a space-friendly footprint…that’s very appealing for a lot of people. If you want to buy a TreadClimber, here are some helpful tips for you. These machines are not meant for runners. They can’t help you develop endurance or speed, but they can help you burn a lot of calories and lose weight in a relatively short amount of time. So just keep in mind these are strictly for walkers at a top speed of 4.5 mph on the TC200. The BowFlex TreadClimbers are relatively expensive because there is no competitor, so make sure this is the kind of machine you are interested in. The good thing is they have a 100% satisfaction guarantee. So if you’re not happy with the machine after 6 weeks, you can just return it for a full refund. The machines help burn calories faster, but you do have to put in the effort and use the machine at least the recommended 3 days per week. So make sure you can at least commit to that if not more to reap the maximum results. If you’re interested in purchasing one of the latest Bowflex TreadClimber models, your best bet is the official site where they often feature special sales and discounts at different times of the year. Which TreadClimber Should You Buy? First, consider your budget. The base TC100 is currently $1999 on sale, and the TC200 is $2999 on sale. So it’s a big difference. Next, decide if you need built in workouts or not. The TC200 has 5 programs, the TC100 has none, so you just use it manually. Also, the TC200 has workout tracking, which many people love these days. That way you can keep tabs on your workouts via the Bowflex App and sync with your favorite workout apps. The TC100 does not currently have that capability. The TC200 also has wireless heart rate monitoring, which is more accurate than the grip measurement. So if accuracy is key for you, the TC200 is a better choice. The bottom line is, if you can afford the TC200, it’s absolutely the better machine. However if you don’t need all of those extras, the TC100 is just fine. Opt for the extended warranty regardless of the model you choose, as you only get 2 and 3 years, respectively, which isn’t a very long time. The additional coverage will give you peace of mind in case something happens with the machine down to the road.